The 2017 Dynamics of Disasters conference has now come to an end. The Elite Resort Hotel in Kalamata, Greece was the location of the conference. The conference attracted speakers and participants from 4 different continents: North America, South America, Europe, and even Australia! Kalamata, Greece is a bit remote (but that is also part of the allure), so this level of international representation is quite impressive. The caliber of scientific presentations delivered by the speakers with the breadth and depth of both methodologies and applications was excellent. I am sure that new research will be generated from the presentations, warm discussions, and new collaborations formed. I especially would like to acknowledge my fellow co-organizers of this conference: Professor Fuad Aleskerov of the Higher School of Economics in Moscow, Russia, Professor Ilias S. Kotsireas of the Wilfrid Laurier University in Waterloo, Canada, and Professor Panos M. Pardalos of the University of Florida Gainesville. Below is a photo of Professor Kotsireas at the registration desk with nice Isenberg School of Management folders for the conference program. Below is a photo of the conference group taken on the balcony of the conference venue. The location has magnificent mountains, proximity to the Mediterranean (and beaches), as well as lovely flowers and vegetation. The conference program can be downloaded here. As always happens in any international conference, there were a few last minute changes. Professor Panos M. Pardalos opened up the conference with a few words also from Professor Ilias S. Kotsireas. The audience had many opportunities for questions and additional discussions. Speaking of papers reflecting the breadth of applications, there was a presentation on disaster communications by the "other" Professor Nagurney (Ladimer S. of the University of Hartford), one on food security and relationships to conflicts by Professor Fuad Aleskerov, who also presented on the modeling of oil spills, and two on freight issues in humanitarian logistics. One of the latter talks was given by Timo Gossler on joint work with his Professor, Dr. Tina Wakolbinger of the Vienna University of Economics and Business, who organized the EURO HOpe conference in Vienna just last week, at which I also spoke at and blogged about. I presented a paper on game theory and multitiered freight service provision for humanitarian disaster relief. Timo Gossler also delivered another excellent presentation on cash transfers in the humanitarian sector for a colleague at the Vienna University of Economics and Business, Ioanna Falagara Sigala, on joint work of hers with Professor Fuminori Toyasaki of York University on Toronto. The Imperial College group in London led by Professor Panagiotis Angeloudis had two outstanding talks, one on network flows and interdependent infrastructure systems after disruptions with a case study, appropriately, on London's public transportation network and electric power (given by Nils Goldbeck), and the other on unmanned aerial vehicles (UAVs) and medical deliveries using trajectory optimization, given by Jose Escribano. Not only were important applications presented but also rigorous methodologies. I had the pleasure of having two of the three coauthors on our latest game theory network model that integrates logistics and financial funds present at the conference: Professor Patrizia Daniele of the University of Catania in Italy and Emilio Alvarez Flores, who is an Isenberg School of Management, alumnus, and who now is at Cisco. We presented on a General Nash Equilibrium model that integrates both logistical aspects of disaster relief as well as financial funds and extends a paper of min with Emilio and Ceren Soylu that was published in Transportation Research E.
Sofia Papadaki, on work with Professor Folinas, and other coauthors, gave a very interesting talk on refugees and associated humanitarian logistics of providing relief. She also presented on work of her professor on International Mine Action Standards and quality issues. Professor Soumia Ichoua of Embry-Riddle University in Florida spoke on the prepositioning of emergency supplies to support disaster relief over a planning horizon using a stochastic programming approach, along with a case study to North Carolina using a large dataset. Her work was with several co-authors. Roberta Messalli presented a paper with Professor Lina Mallozzi of the University of Naples on equilibrium analysis for common pool resources, which I also enjoyed very much and was delighted to see citations to the Mobel laureate in economics - Dr. Elinor Ostrom (who remains to-date the only female recipient of this prize and sadly passed a way a short time ago) and also to Dr. Daron Acemoglu. Both these outstanding researchers I had the chance to hear speak (and the latter even host) at the University of Massachusetts Amherst. It was very interesting to see applications driving advances in modeling and theory and it is clear that the researchers' passion for a topic often has some personal resonance. We were privileged to hear the talk of Professor Dmytro Matsypura, who traveled all the way from the University of Sydney in Australia, and who spoke on his joint work with Professor Oleg Prokopyev of the University of Pittsburgh. Matsypura presented a paper on wildfire management through the use of network-based models and optimization of prescribed burning. The paper has been accepted for publication in the European Journal of Operational Research. Wildfires are an international issue and there was also a very interesting talk by a group from Chile: Gabriela Alfaro, Pablo Escalona, and Monica Lopez-Campos on the use of coverage models for the allocation of mobile units for forest fire extinguishing with a case study on Valparaiso. In addition to the scientific sessions there were also social events including an excursion to the Diros underground caves as well as a conference banquet. 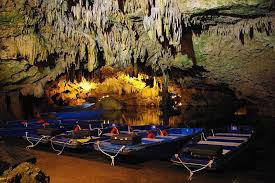 At the Diros caves, a true natural wonder, the group git to see breathtaking stalactites and stalagmites while being propelled by a tour guide in boats and when told to "duck", you had better do so. Photos of the conferees getting ready for the conference excursion to the Diros caves are below. Of course, there were other opportunities to enjoy breakfasts, lunches, breaks, and even the scenery together. Several conferees even managed to make it to the beach. In addition to the amazing company, the food was delicious! Many thanks to my fellow conference co-organizers and to the speakers who traveled to share their research on topics of great relevance to the dynamics of disasters. I leave you with a photo of a sunset in beautiful Kalamata.